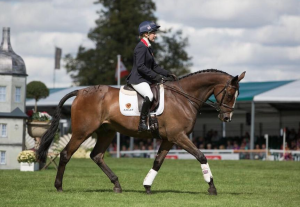 Ever since Kauto Star’s appearance in a ‘demo’ at Olympia, which can be seen HERE if you haven’t seen it already, the equestrian world has been abuzz with varying opinions about what went on. Kauto and Laura Collett doing at demo at Burghley 2013, on a good day. 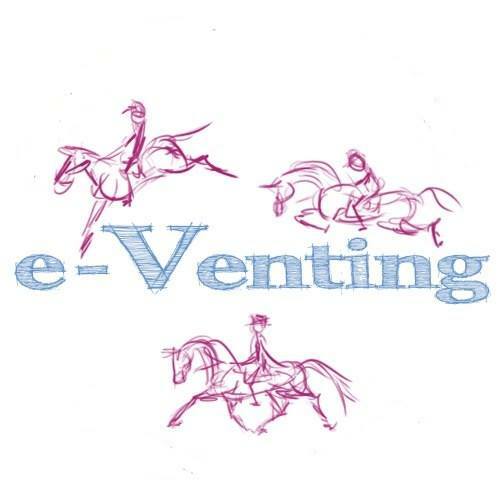 Photo by Katie Mortimore Photography for e-Venting. 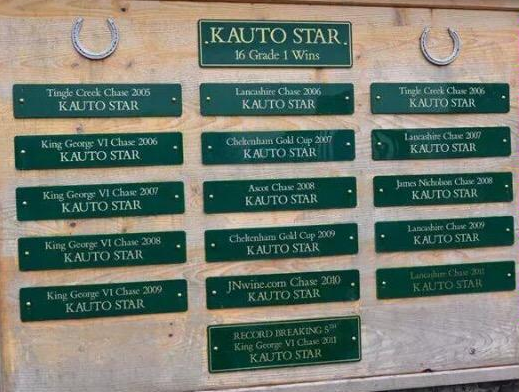 Of course, we don’t know exactly what caused Kauto Star to go like that. Was he worked too hard for too long before the session? Was it really ‘stage fright’ at the big, close-to-the-arena crowds, bright lights and huge atmosphere for which Olympia is famous? Did the 10.30pm demo time (switched from an early 6pm slot apparently) not suit him at all? Was he perhaps given a calmer or sedative to make sure he wasn’t explosive and potentially dangerous in such a setting? Did he ‘tie up’ (muscle cramps of the huge hindquarter muscles, which can make a horse become very reluctant to move) which would have shown up in a blood test straight after, if taken? I don’t think it actually matters much WHY he went like that. The unpalatable but inescapable truth is that this living legend of a racehorse, who won 16 Grade 1 races, netting his connections £2,375,883 (no, that is NOT a typo, it really does read £2.3 million pounds), who is right up there with Arkle and Red Rum in the pantheon of the very greatest National Hunt racehorses EVER, who romped to an unprecedented FIVE King George VI Chase victories and won the Cheltenham Gold Cup twice, was reduced, publicly, to looking like a worn-out riding-school kickalong, one which a very good 4* rider could barely get to move. He is no ordinary horse, he is a god among horses, but somehow ended up looking worse than most of them. As a reasonably experienced rider, and the owner and rider of a sometimes-hysterical ex-racer, I can personally attest that it is very unusual for a hot-blooded horse to react as he did to that sort of atmosphere and treatment. Ex-racers don’t usually shut down and try to refuse to move. Getting hyper-reactive and trying to zoom away from whatever is bothering them is usually more their style. Lest we forget… the Wonder Wall. Picture by kind permission of “GalileoTheStud” on Twitter. I am 100% not undermining Laura Collett’s usual riding ability. She has already achieved far more than I ever will in the saddle. She is trained by the best and rides lots of incredibly talented horses very impressively, with great success, at high levels. Nobody is taking that away from her. This is absolutely not a bitchy post about her riding, heaven forfend. I am not criticising Kauto Star’s care. He looked great in himself. I am sure he has a very nice life at her yard. This is not a welfare case… god forbid. There are neglected horses all over the country literally starving to death… so, please, anyone who wants to play the ‘welfare’ card, for god’s sake get a bit of perspective, and go and flash it where you can save some poor equine who desperately needs your help. The fact is that most horses who do exceptionally well at their first career, well enough to be a household name, automatically earn a very nice retirement, especially if they are owned by people who can afford to do that for them. This horse had, in the eyes of his adoring public, more than earned his keep for the rest of his days. He owed nobody any more limelight, wins, or anything else. He deserved either a quiet retirement (and mooching around in a field with his mates for the rest of his days, just being a horse, well-fed and well cared for, would not be a grim fate) or a new job that he obviously enjoyed. Escorting the young racehorses on the yard (where they were desperate to keep him, if press stories at the time were true) or perhaps a different career of hunting and/or Team Chasing, as the other legend from Paul Nicholl’s yard, Denman, who was always stabled next to Kauto Star, did. Photos of Denman (such as THIS article posted yesterday… interesting timing, H&H!) show a horse with ears pricked, running and jumping keenly. That, to the horsey public, is a demonstrably ‘happy horse’ in a new job that he enjoys. Unfortunately, however they dress it up, however good Kauto Star looked in previous demos with Laura Collett, he did not look like a happy horse the other night. He was swishing his tail, and very reluctant to go forward, ignoring kicks from the legs, repeated flicks from the whip and tugs on the reins (actions which made a lot of us wince). This is the horse who galloped tirelessly for miles and sailed over steeplechase fences with impunity, winning fortunes for tens of thousands of adoring fans? If it had been just any old racehorse, we would all have probably said ‘tough luck, the horse just ‘shut down’ for some reason’… but this is Kauto. He is not, and never will be, just ‘any old racehorse’. He’s the racing public’s darling. He didn’t deserve that treatment, whatever the cause of his behaviour. Once he started to go like that, and it didn’t get better after a few determined urgings, someone, and it doesn’t matter who, should have stopped it. We all know horses have their good and bad days (for whatever reason). If Laura had patted him, jumped off, and said something like “sorry everyone, it’s not working tonight, he’s not coping with the atmosphere, bless him” and just led him around and out, I doubt anyone would have had anything but the highest praise for her. No rosettes were at stake, and she’s more than used to riding in front of a crowd. If Yogi Breisner, who was in the arena commentating, (an incredibly experienced trainer who always knows exactly what he’s looking at, having steered TeamGB’s eventers to countless international victories for many years) had said something similar, giving Laura the signal to stop and bring him in, I’m sure we would all have sighed with relief and let it go. That’s horses, sometimes it doesn’t quite work. We all know that. Surely they could have chatted about him until the Olympia organisers sorted out a filler for the time Kauto should have filled strutting his stuff. But unfortunately that didn’t happen. His sides were kicked and the reins were tugged to absolutely no avail, and he just looked increasingly reluctant and unhappy. Even if it was just a one-off, even if it never happens again… what next? He’s never going to be ‘a dressage horse’. I hugely doubt they’d be willing to risk him going Eventing, and Laura Collett has no shortage of fantastically promising event horses to ride already. At his age, and history, he’s not going to Rio. What beckons… local dressage at the lower levels, to win a rosette? Are they going to persist in this endeavour, trying to prove everyone wrong? Unfortunately, it looks as if the legions of vociferous racing fans who so loudly and publicly lamented Kauto’s removal from Paul Nicholl’s yard and proposed career as a ‘dressage horse’ with Laura Collett two years ago were all absolutely right. 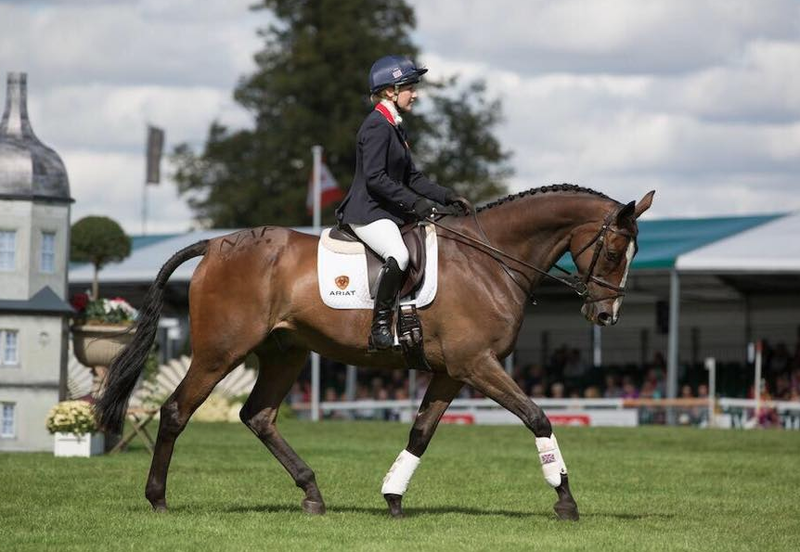 Mission accomplished, if the mission was to find a generous new Owner for a hugely promising young event horse for Laura to ride, hopefully to future Team glory – Pamero 4, the 2* horse sourced from Germany for Kauto’s owner Clive Smith, has had a phenomenal year with Laura ably piloting him. An absolutely heartfelt Good Luck to them. I hope he continues to go from strength to strength for her. I hope Clive Smith likes being an Event Horse Owner as much, or more than, he likes being a Racehorse Owner. If Pamero 4 and Laura Collett keep going as they have been, perhaps he’ll be an Owner at a major Championships. But if the mission was, as it should have been, to find Kauto Star something fun to do for the rest of his days, and show the doubting, vociferous fans that he is enjoying it, I fear it has, most publicly, failed. In the week where a statue commemorating him will be unveiled at Kempton, nobody is forgetting that the Legend is still Living. I devoutly hope the horse will be put first from now on. He deserves it. Winning Riders – Please Attend Prizegivings!!! If Laura had patted him, jumped off, and said something like “sorry everyone, it’s not working tonight, he’s not coping with the atmosphere, bless him” and just led him around and out, I doubt anyone would have had anything but the highest praise for her. I agree with the article. It made me feel sick that such a great horse – or any horse – was reduced to being jabbed in the mouth and kicked in the ribs in such a way. Disgraceful. excellent article – I would only add that it is Mr Breisner who should take full responsibility for failing to act when things didn’t go to plan. Brave and bold as Laura is, it would have taken a lot of courage to publically stop the ‘performance’ but Yogi was the ‘senior professional’ on the night – he did nothing and he has left Laura to take all the criticism. I have an exracer who does shut down like that to the point where she completely refuses to move. She does it when she is unhappy in her mouth. If someone holds too much without enough leg to push her into the contact or if she is caught in the mouth by an unsteady hand or held by someone nervous she will shut down. She does it through pain and fear. Her heart rate rockets and her stress levels are high for days afterwards. It is unusual but I’ve heard of other TBs doing the same and they also react through fear or pain not excitement. If I took my mare to Olympia she would react like most TBs in that highly charged environment, I very much doubt she would shut down and I was surprised they thought KS’s reaction was stage fright. Obviously I don’t know why KS did it but I agree it’s unusual to react like that to atmosphere but it is possible he reacted to the way he was ridden in an effort to prevent him exploding. It looked like Laura was taken by surprise by his reaction and hopefully they will work to find out what upset him rather than assume it was the atmosphere and ensure he’s not put in that position again either through preparation or a change of plan. Interesting – until now I hadn’t seen the actual performance, just a little of the warm up which looked OK to me. I don’t know how much he did outside – but perhaps it was too much. But I agree, it did start to go very wrong in the actual arena – and somebody should have stopped it. That somebody should have been Yogi Breisner. Very sad to see. Completely agree with this article. Big fan of Laura Collett and was shocked she didn’t jump off straight away…lack of professionalism. Would love to see him hunting, every horse I’ve had has always hunted..They love a party! let him do what all great race horses do, open a few super markets ,turn on the xmas lights, & parade at the races he was so great , He owes MR Smith nothing !! The horse was unhappy (for whatever reason). The rider should have halted her participation in the performance. Had the rider felt she could not due to location and pressure, Yogi should have stepped in. The process of bringing the performance to an end would have been kinder to the horse, saved Laura from what will be a difficult backlash to sideline and would also have educated those watching that part of racehorse “re-training” is responding to their needs as they arise and not forcing them into anything, irrespective of glory/cost/etc. No happy horse behaves in the way we saw the other night. I hope the owner steps in and gets to the bottom of any factors that caused his legend of a horse to be as he was and if there is nothing underlying, then they must be sensible enough not to put the horse through that again. What a sad sight to see at Olympia. Such a fantastic horse reduced to looking a shadow of his former self. Someone should have called time on this demonstration, had a chat with the crowd, patted him and put him away. Let him shine again another day. He has been with this eventer for 2 years and has yet to make an appearance at a competition of any kind, even at the lowest levels. Compare this to Ichabad Crane here in the US. He was a very good racehorse who was entrusted to an Olympic eventer. The horse has now been in training for his new career for just over a year. He has already moved from Beginner Novice -> Novice -> Training. Based on his talent, the plans are to try him at Preliminary next year. Why hasn’t Kauto Star been in a similar program which will see if he is meant for a second career as a riding horse? When the lady rider was interviewed after the debacle, she admitted that she had many nice horses under her care and Kauto Star had been forgotten about. And he might remain in the background in the future because this woman does not have time for him. If I were the owner, I would already have made a change in his situation. This nice a horse deserves more than to be the forgotten horse in a barn. Top horses love attention and love to compete. In my experience, many of them do not do well in retirement — it is not a favor to them. Kauto Star may make a wonderul hunt horse — why not give him a chance at a career which he enjoys? Aren’t we all failing to take in to consideration that the owner didn’t want Kauto Star jumping any longer, hence the career change into dressage. Hunting/jumping could potentially injure or worse kill the horse which is I feel what the owner wants to avoid and therefore prevent another backlash. I didn’t realise that. He is still being jumped at home though, Laura Collett has posted photos of him jumping (under saddle). I feel very sorry for this lassie, who has been vilified. The horse was not expected to perform this way – otherwise he would not have been there ! Yes she could, and probably should have, retired but must have felt compelled to finish. Kauto Star is in superb condition and clearly is well cared for. He would have no idea what all the fuss is about – he is back home, in his regular routine. He is not dwelling on this event ! Ironically, the people who are most outraged by his ” suffering ” are the same people who loved his racing appearances. Every time he ran, he risked death or traumatic injury, in a sport that has huge casualties. No one shouted about his welfare then !!! I am not a fan if racing, nor do I strongly object to it, but I think this discussion has been vitriolic toward the rider and blown totally out of proportion. I think instead of trying to find fault and criticizing anyone involved it should be said that a decision was made and it didn’t go well on the night! The horse looked well, he obviously was expected to perform in this environment and didn’t! We should all be wishing everyone all the best for the future! Unfortunately fame puts individuals in the spotlight and the culture today is to find fault and pull it to pieces. 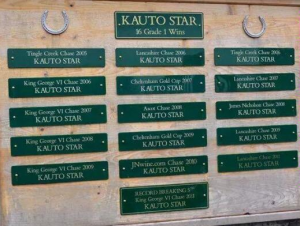 Kauto Star was a legend on the racecourse…… he is alive and well…. Hooray!! The human ego came into play here and pressure to perform over the horses welfare. I’m not sure if like to be kicked in the ribs and have my mouth yanked on. This is not a professional performance others should aspire to regardless who the horse is or who the rider is. The horses health looks fantastic physically but his emotional health doesn’t look fantastic. The horse doesnt look a patch on the condition that Paul Nichols team used to send him out in, he looks a shadow of his former self. He is a superstar horse, a very clever and intelligent horse and quite honestly just looked plain bored. He is being totally wasted with Laura, who is a lovely rider despite what she did in this video, she has better horses to work with. If his owner wants him to have a dressage career then send him to a young rider desperately looking for a good ride who will appreciate him, not leave him with a rider with plenty of good rides to choose from so overlooks him. With no disrespect, this is like a replay of ‘The Kings New Clothes’! A truly special horse, so sadly being ridiculed….and for what??? A night in the limelight at Olympia for his connections. I went to Olympia last Tuesday simply to see Kauto having followed his racing career for many years. I sad when he was retired, but glad that at last he would be safe. Like many racing fans, I was not sure about him taking up dressage, but having seen him perform with Laura a few times since he shas done amazingly well. I was so disappointed for him and Clive over what happened last week when he had a real chance to shine. I think it was too late at night – he had been there all day – and perhaps the indoor arena did upset him, surely it wasnt fear of the crowd as hes used to much bigger audiences than that. As others have said, Laura should have dismounted and led him out and Yogi must take some of the blame for not encouraging her to do so. I was sitting by the entry doors when they went out of the arena, Laura looked furious and poor Kauto haunted – I have never seen him look like that before. Met Clive afterwards who was baffled as to what had happened and was rushing off to find out, I just hope Kauto is OK and the experience wont affect him for the future. I haven’t seen the outing at Olympia and now I don’t think I want to, but I feel too many conclusions were reached when his new occupation was announced. It seemed to me that his owner wanted him to be well looked after, no expense spared, with something to think about. I cannot believe that anybody seriously thought he would compete at dressage and the media has puffed up that side of the story. His appearance was meant to show what a racehorse was capable of doing after retirement and for whatever reason he didn’t want to play, which any horse owner, particularly of a T B, will tell you can happen any time. It can be even sadder when an enthusiastic racehorse is left in a field watching his mates go off to the races and I have no doubt that Mr Smith only wants the best for his horse. He said no; in the public arena or he must have been sedated. Either way please stop it! A chimpanzee in a cage made to perform is safe and well fed, if he fails to perform, he gets the whip; he then can get depression and closes down. Is this what Smith wants- a performing chimp.